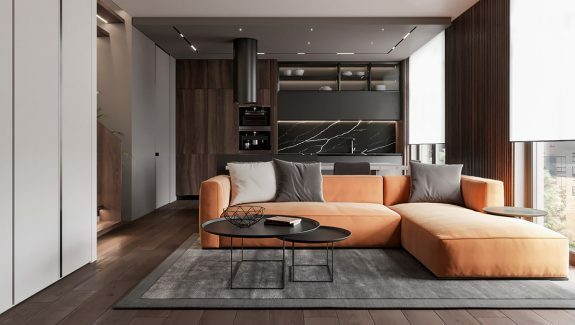 Linear silhouettes and a palette of modern neutrals dress this 110 square metre apartment in Moscow, designed by ATO Studio. 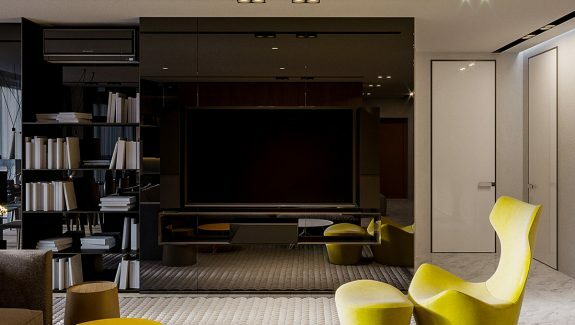 This is a family home with an open plan living space that encompasses the lounge area and a kitchen diner, where family members can come together even when partaking in different activities. The entryway stands wide open to the living room to create an extra feeling of space and free-flowing energy. 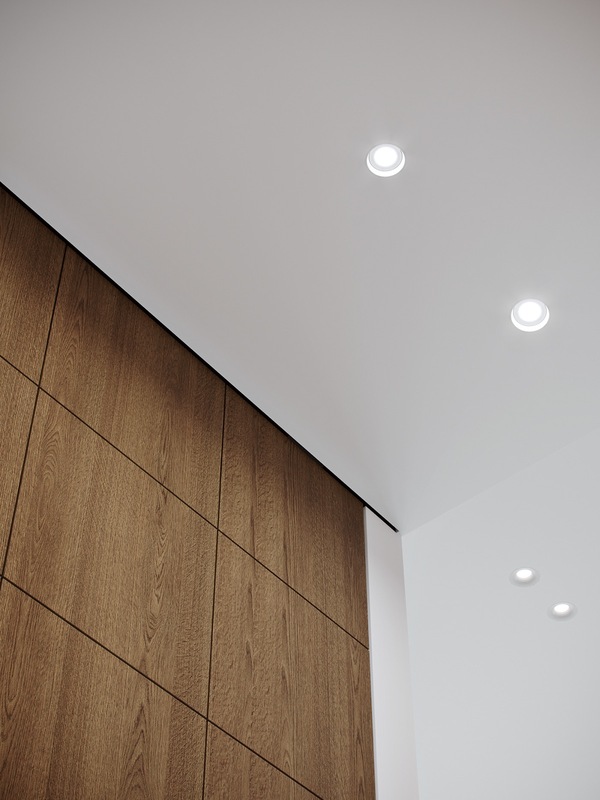 A subtle lighting scheme of recessed spotlights, LED perimeter lights and simple pendants glow in each space. 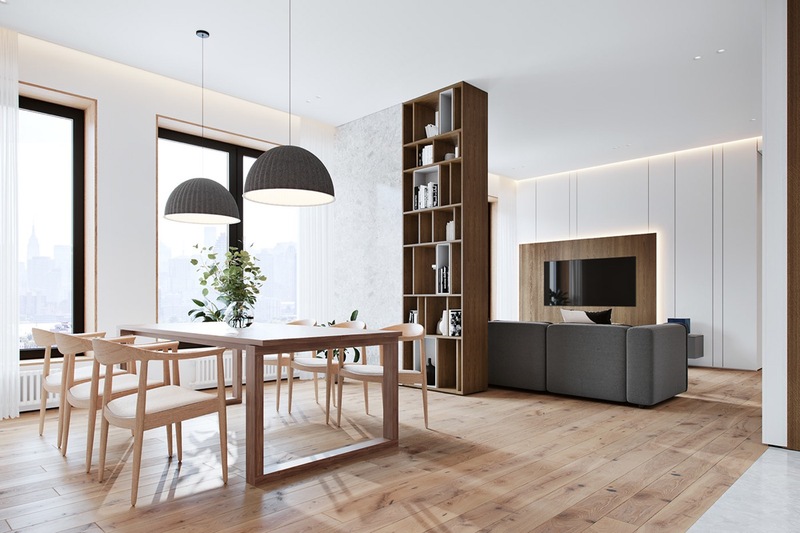 The careful lighting plan evokes a cosy ambiance in the peacefully decorated rooms, giving off a practical amount of light without complicating the decor. 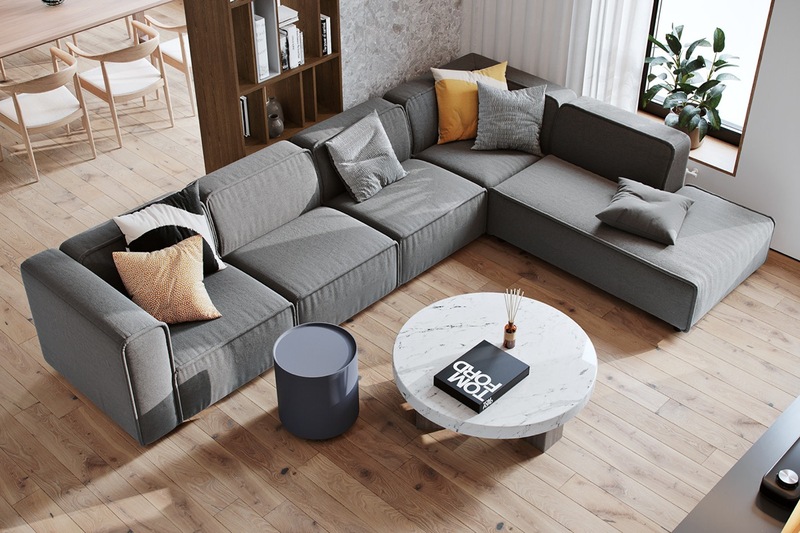 A generous sized modern sofa allows for everyone to come together for movie night or for some light tv. The grey sofa has been brightened with a couple of yellow throw cushions. The home entryway can be seen from the large sofa. Wooden storage units flank the length of the foyer. A line of shining spotlights lead the way to the door. 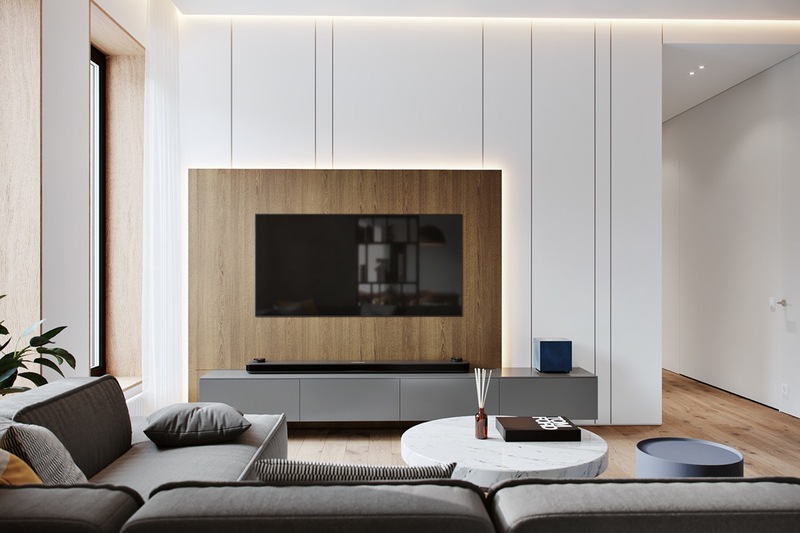 The tv wall decor is made up of white and wood panelling, which glows around the edges with LED strip lights. A grey wall mounted media unit crosses below the flat screen tv. A white marble modern coffee table serves the sofa, along with a small side table. The marble tabletop is decorated minimally with a reed diffuser and that famous Tom Ford coffee table book which seems to be the darling of interior designers and visualizers. 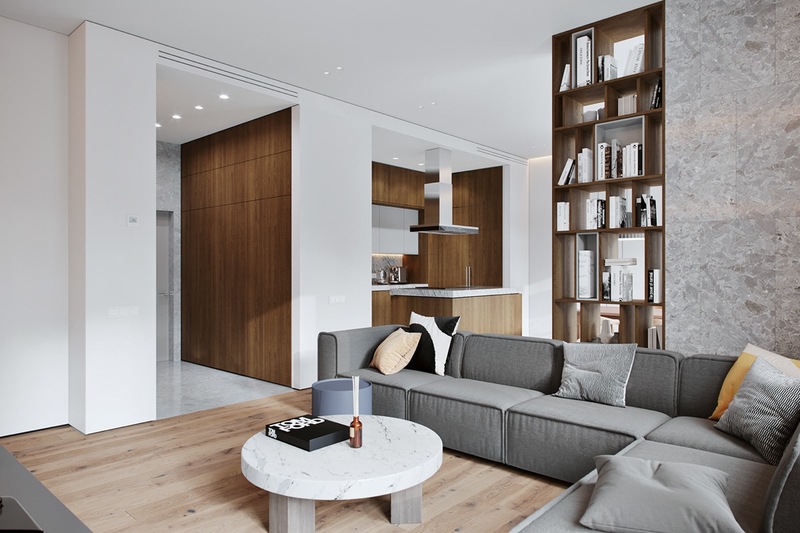 DIsplay shelves make up part of a room divider between the lounge area and the kitchen diner. The shelving displays a modest selection of books and a number of knick knacks. 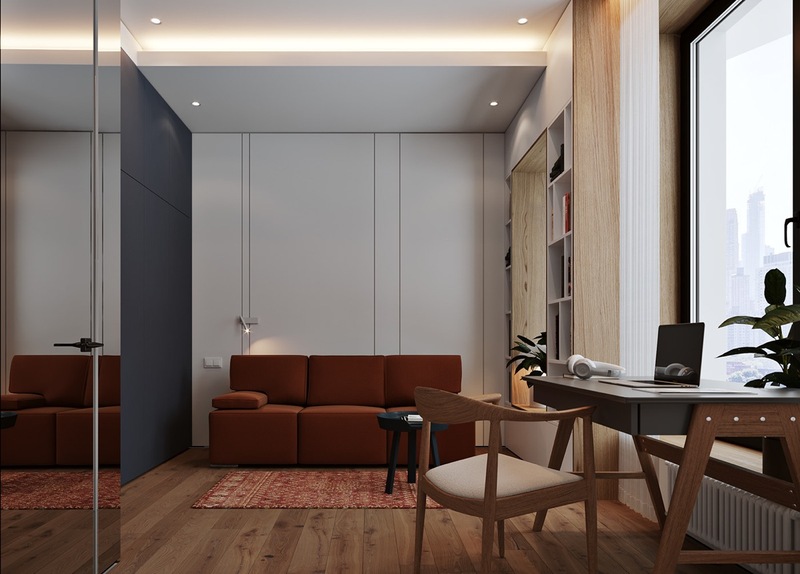 A wooden dining set with six Scandinavian style chairs hide from view of the lounge behind the partial room divider. Two half globe dining room pendant lights illuminate the eating area, as well as plentiful natural light from the large adjacent windows. 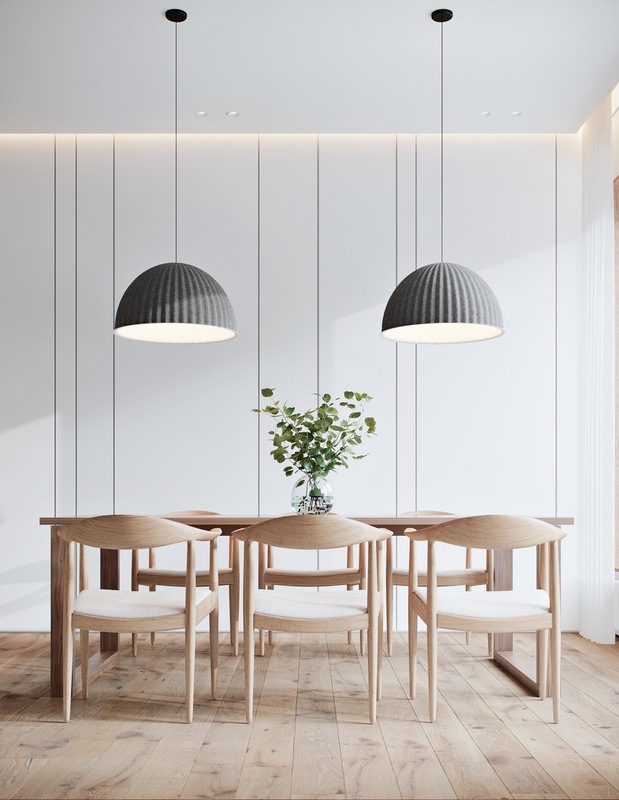 The minimalist dining room is decorated is calming neural shades of light wood, slate grey and purest white. A spray of natural greenery makes a centrepiece on the table, in a clear glass vase. 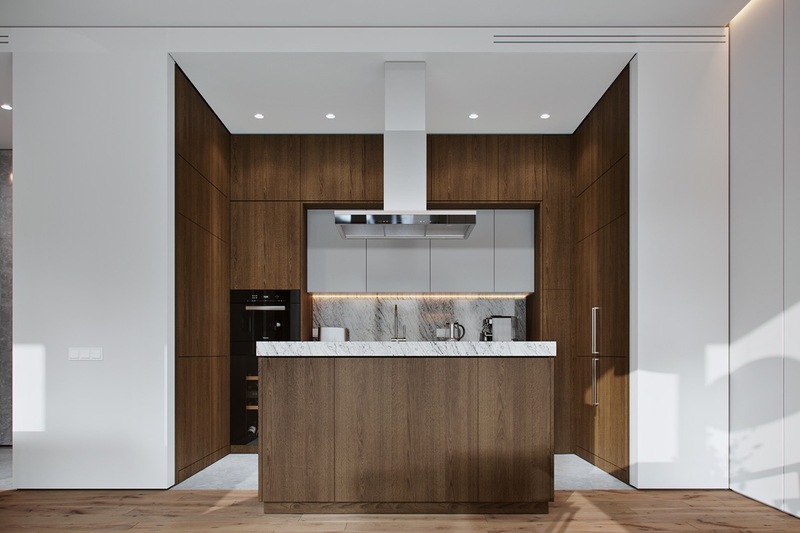 A white and wood island kitchen is set back out of the main rectangle of the room, in a nook without windows. 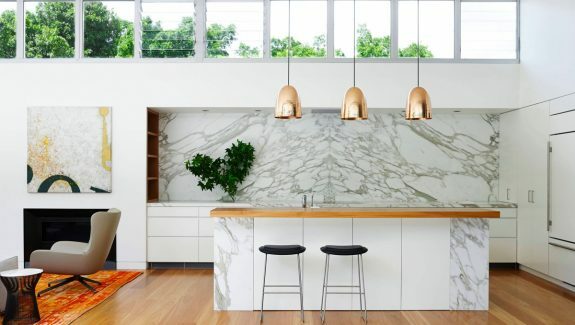 The u-shaped kitchen gets its light from the windows in the dining area and from a series of LED lights set into the ceiling and under cabinets. 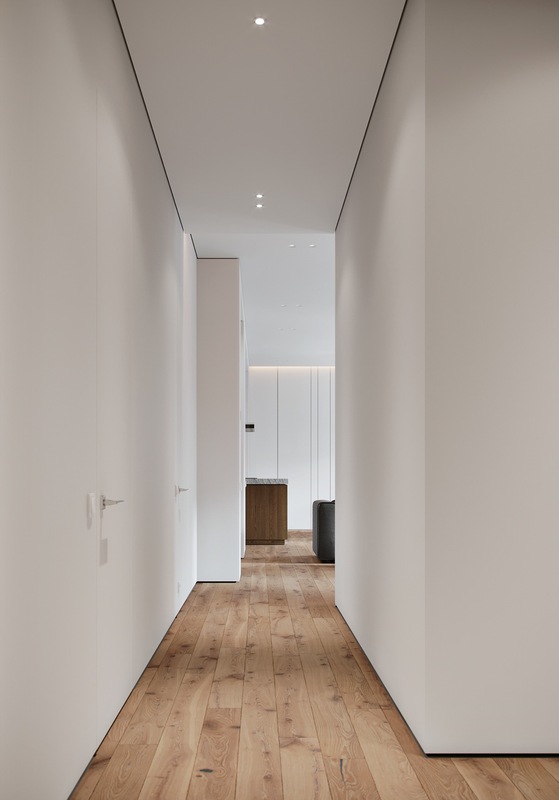 To the right of the tv wall, a white hallway leads to the bedroom. Wood flooring continues out into the hallway from the main living room. 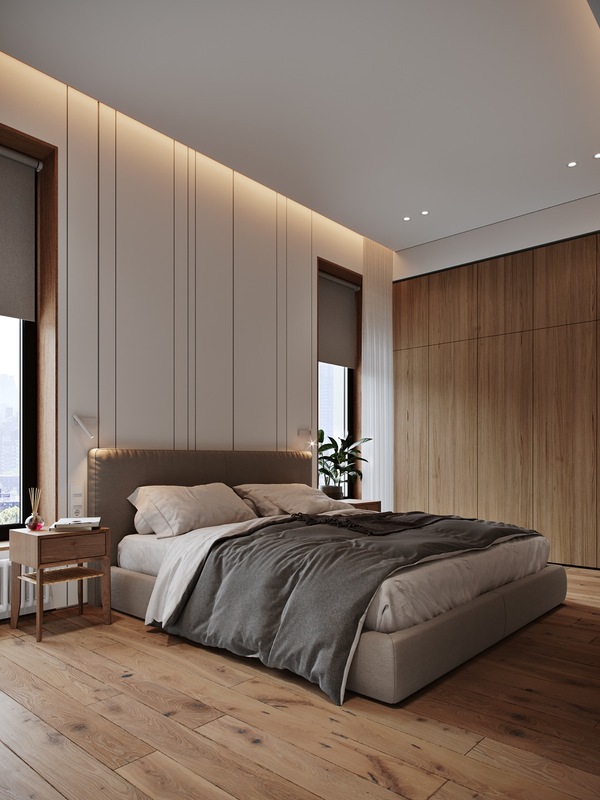 The modern bedroom follows on with the same peacefully neutral decor of white and wood panels. A grey fabric platform bed looks soft and inviting. 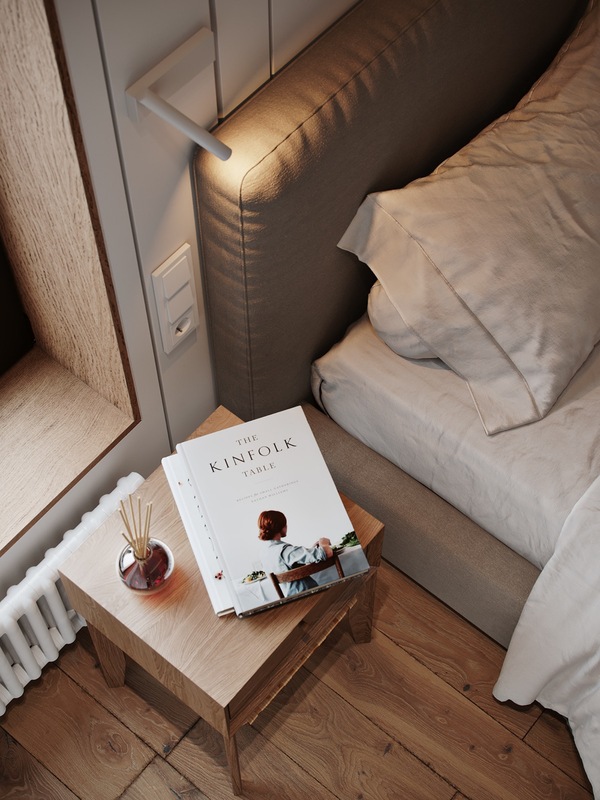 Small white modern wall sconces provide reading light at each side of the double bed. 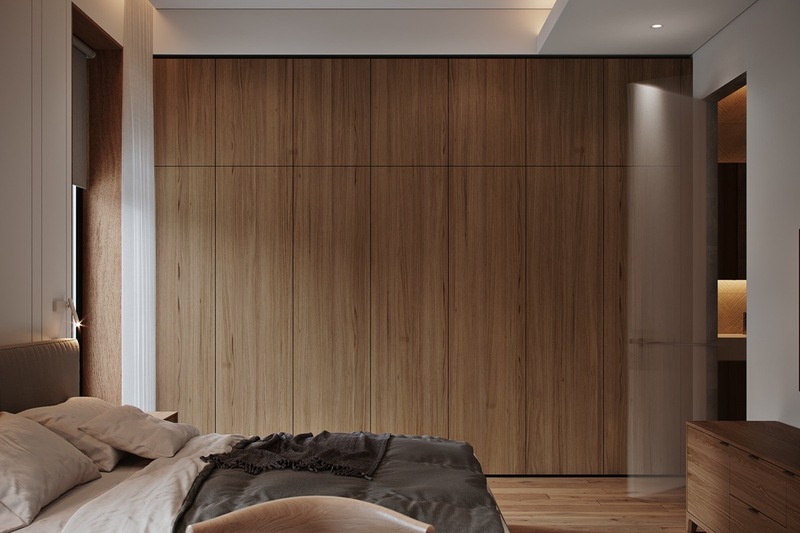 Wooden window reveals match the run of wood wardrobes that flank the bed. Plentiful storage space is provided behind handle-free doors. 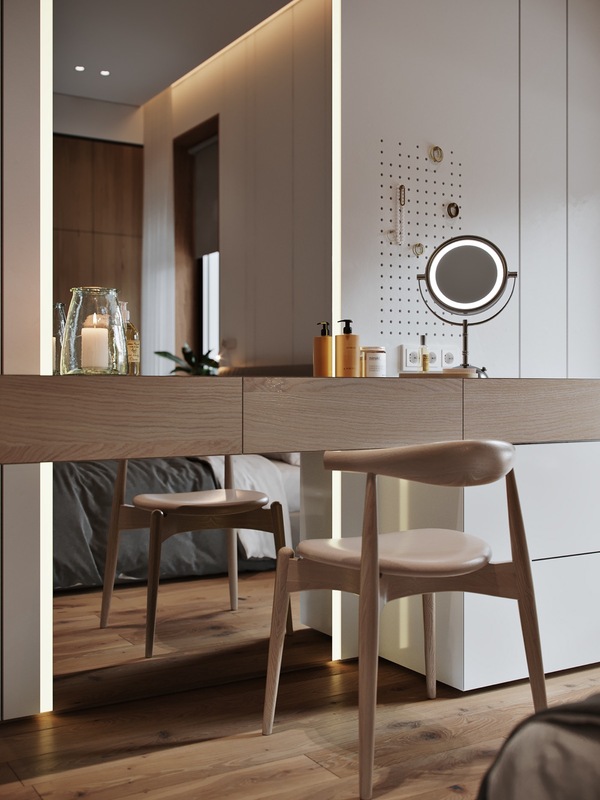 To the other side of the bed there is a makeup vanity, which is wall mounted to cut across a full length illuminated mirror. A tabletop vanity mirror shines brightly in front of a pegboard that is used to organise jewellery and hair accessories. The chic vanity chair is the Wegner style elbow chair. At the foot of the bed there is a wall mounted tv and a floor standing media console unit. 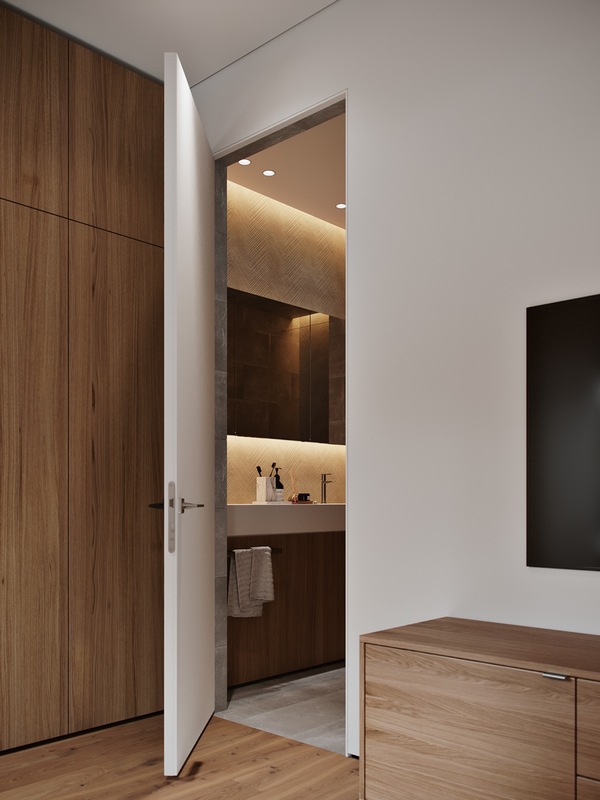 A door leads to an ensuite master bathroom. 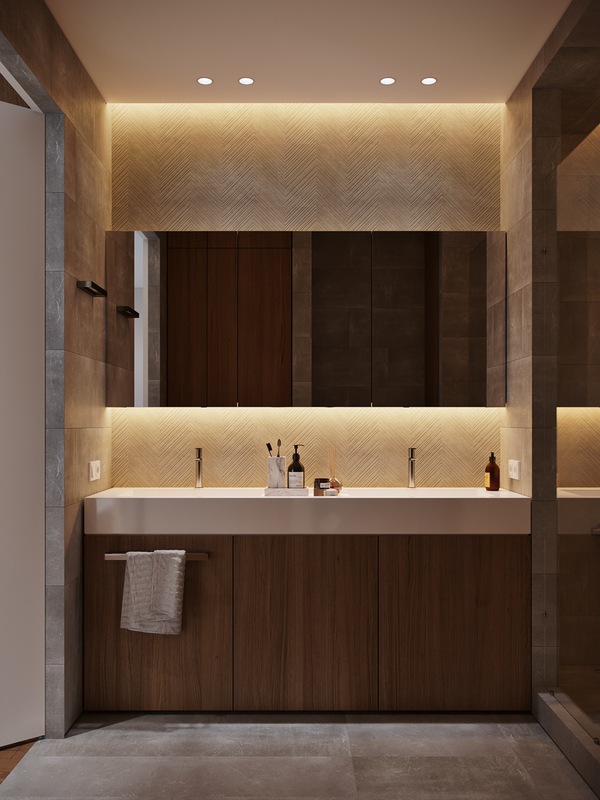 A double sink bathroom vanity spans one wall of the ensuite, beneath a row of three mirrored cabinets. 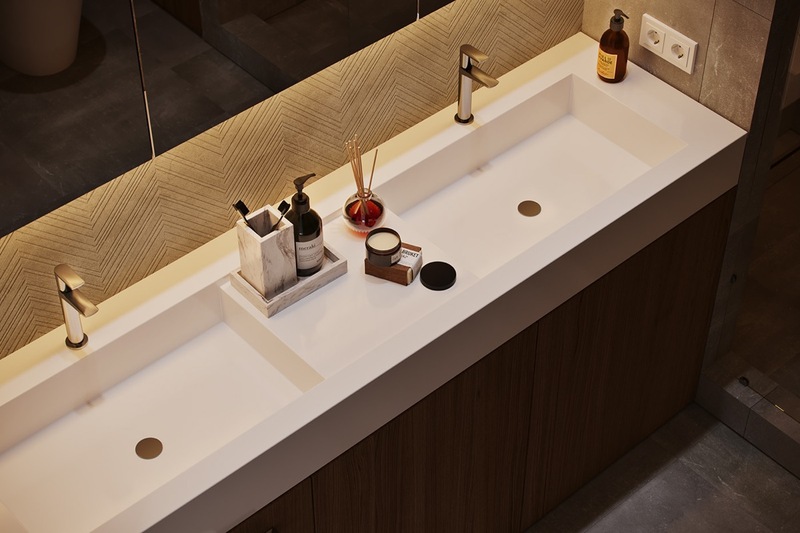 Under cabinet lights glow down over the vanity backsplash, which is etched with a chevron design. The chevron wet-wall climbs the entire height of the basin wall, and also covers the back of a walk-in shower. 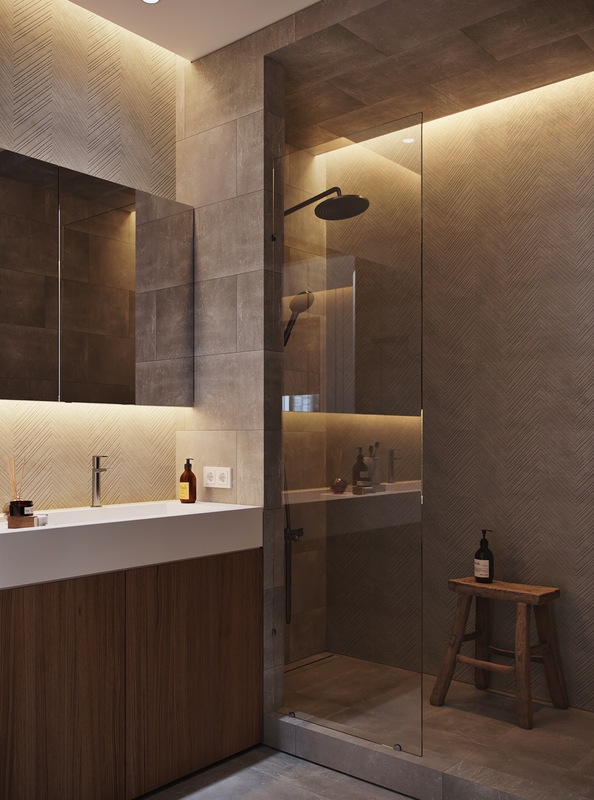 A frameless shower screen keeps the scheme clean and uncluttered. 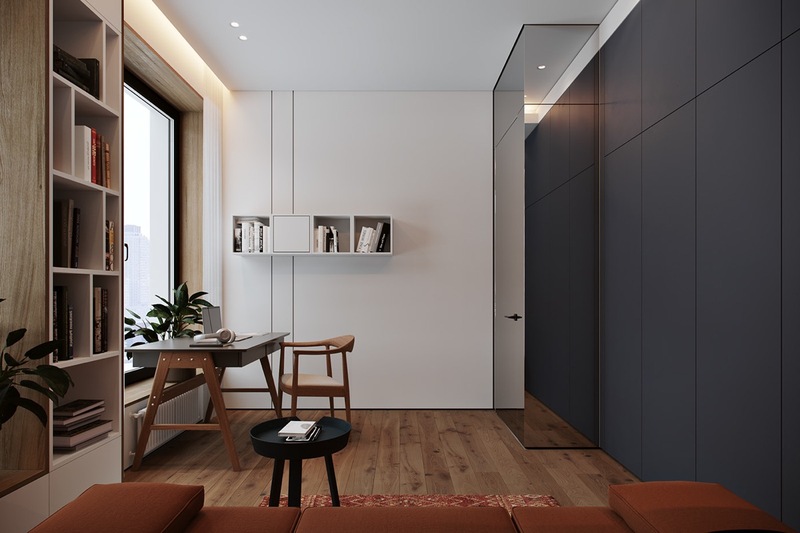 A built-in cabinet offers floor to ceiling storage. 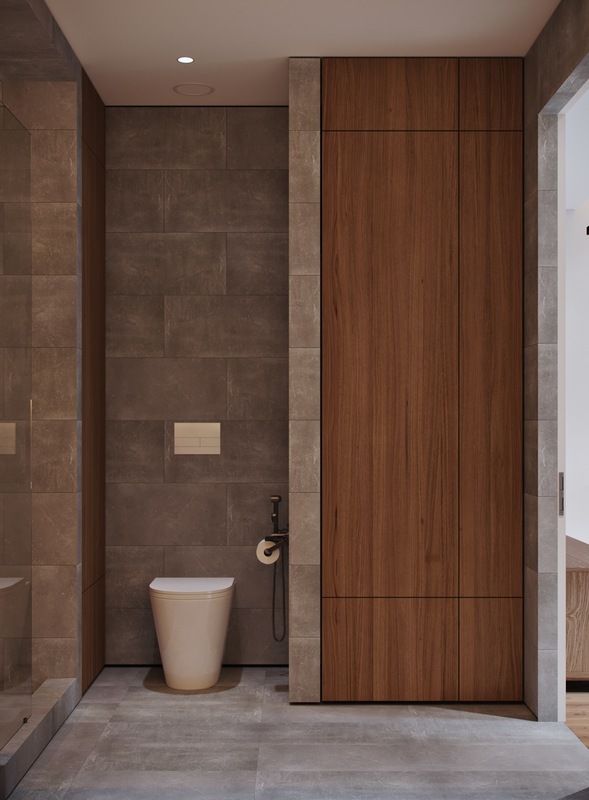 The toilet cistern is concealed behind a grey tile wall. 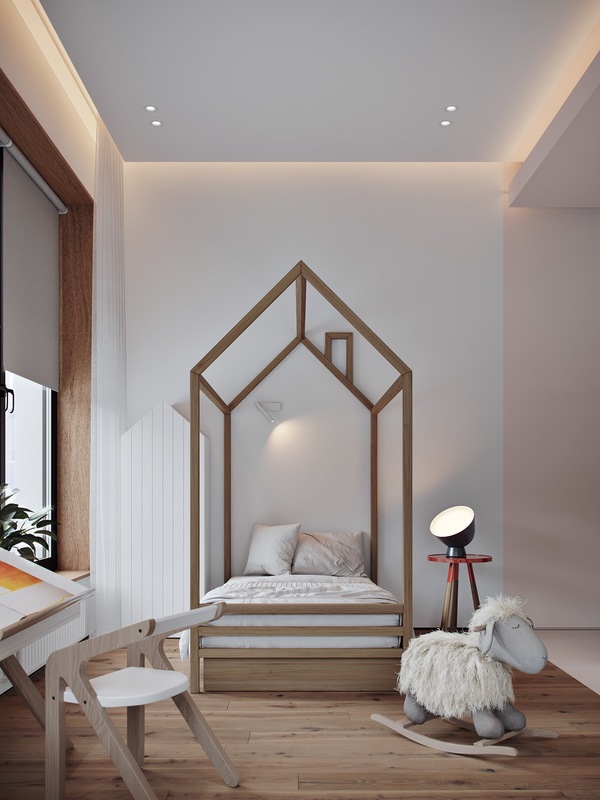 A pastel kids’ room holds a wooden Montessori house bed at its centre. By the bed, a house shaped cabinet continues the theme. The pitched bed frame makes a cosy canopy; you can find other beautiful 4 poster beds here. House shaped chalkboards add a unique touch to white closets. A cool bedside table lamp stands on a modern side table with a red top. One section of the wood flooring has been painted in pastel pink to match the pink wall stripe. Sheer white drapes and pale grey blinds dress the window. Russet tones warm a modern home office, in the shape of a chunky sofa and a patterned area rug. The stylish desk is situated by the window to make the most of natural daylight. A black tray table serves the seating area. 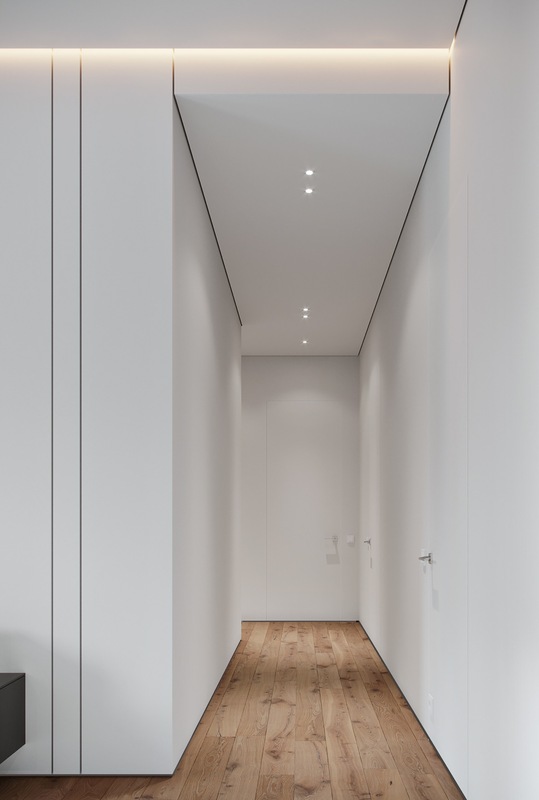 Large dark grey storage cupboards are reflected in a mirrored volume around the doorway of the room. A neat white wall mounted storage cabinet holds reference books and office supplies close to the desk. White wall panels back the blocky sofa. 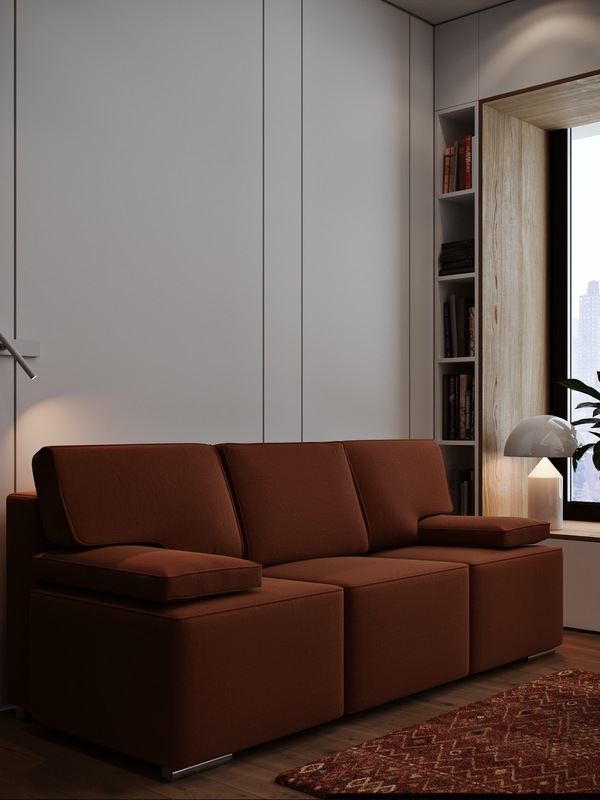 This becomes a reading nook with the addition of a narrow bookshelf, a neat wall sconce and a stylish Atollo lamp. Cheaper replicas are available on Ebay. A second bespoke bookcase helps to frame the window with a chunky wooden reveal. 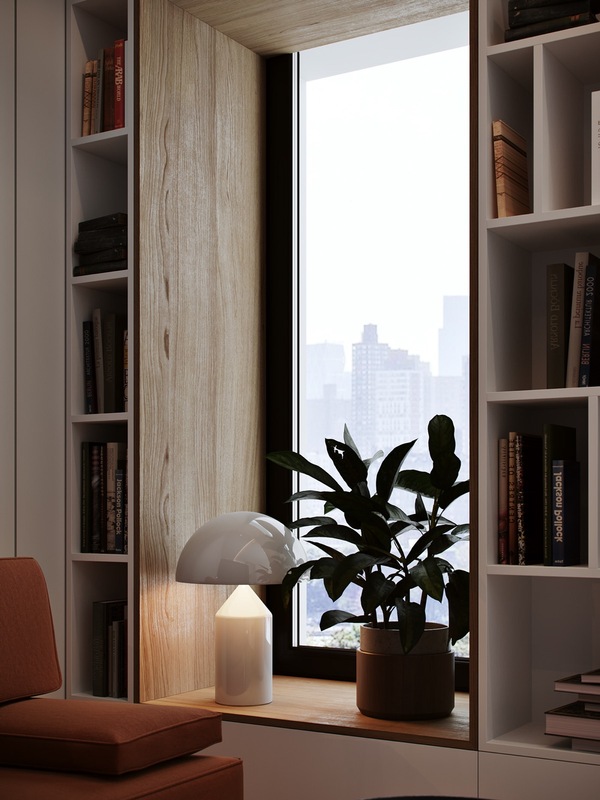 A potted plant joins the Atollo lamp on the wooden window sill.